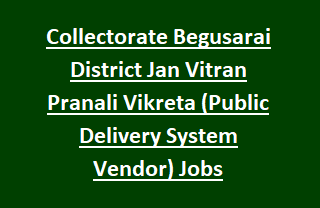 Collectorate Begusarai Recruitment Notification 2017: District Collectorate Begusarai has given notification to recruitment candidates for Jan Vitran Pranali Vikreta (Public Delivery System Vendor) vacancies. There are total 115 vacancies available in Collectorate Begusarai Recruitment 2017. Interested individual have to apply for the above posts from 22-11-2017. Application forms can be downloaded from the official website http://begusarai.bih.nic.in/. Fill the application in proper format and submit with photocopies of all mentioned documents/ certificates on or before 05-12-2017. Application must be reached to the address District Collectorate, Begusarai, Bihar. Educational Qualifications, Pay scale details are given in notification. Collectorate Begusarai Recruitment vacancies selection is based on written examination and Interview. Pay scale for selected candidates admissible as per the government norms. Please go through the notification for Application procedure, Selection process, Age limit, Pay Scale details regarding District Collectorate Begusarai Recruitment 115 Jan Vitran Pranali Vikreta govt vacancies 2017. Total available vacancies in District Collectorate Begusarai Recruitment are 115 posts. Go through the Notification for Educational Qualifications for the current recruitment vacancies. Age limit for the Jan Vitran Pranali Vikreta Jobs is based on Bihar Govt instructions. Please refer the official notification for more details. Candidates will be selected for Collectorate Begusarai Recruitment Jobs is based on their merit score obtained in written examination/ Interview. Go through notification for selection Process details. Eligible candidates have to send application forms for the post Jan Vitran Pranali Vikreta using the official website of Begusarai @ http://begusarai.bih.nic.in/. Application form submission starts from 22-11-2017. Last date to send application forms is on or before 05-12-2017. Go through the notification for application procedure details.